The Department of Education (DepED)in La Carlota started its first of the three series of advocacy orientation on K+12 to their internal and external stakeholders today at the conference hall of the Division of La Carlota City. The orientation was divided into two sessions. The first session was in the morning and it was attended by schools' teachers league officers of District I and II. And the afternoon session was intended for the District II and Secondary schools' teachers league officers. The purpose of this gathering is to orient and mobilize the school's stakeholders on the effect of globalization which brings a "myriad of changes" in the education sector. 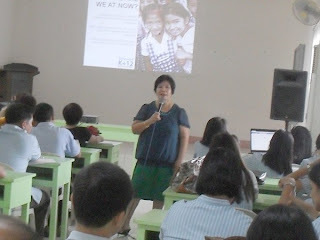 La Carlota Schools Division Superintendent Juliet A. Jeruta in a memorandum said that the different prime movers like the teachers, students, parents and the community are the key advocates of the steps on universalization of "kinder education" as initial year of the K+12 on June school year 2011-2012. Jeruta conducted the 4-hour orientation. The participants were required to come up with an action plan, entitled "move to have all 5-year olds avail [of] "kinder education" this summer and the whole school year beginning June 2011. To appreciate the introduction and importance of Enhanced K+12 of the Department of Education, a well-prepared PowerPoint presented was shown. Jeruta expounded every principle and key points on the said program. Jeruta echoes a battle cry: "It takes a whole village to educate a child" that runs true to the trends that Philippine education has to face today. The next schedule of orientation is March 5 for the schools' pupil government officers of both elementary and high schools. The session will be in two sessions again, morning and afternoon. What Makes Teachers Happy in School? As a part of enrichment on her presentation, Jeruta cited 5 principles on making teachers happy in school.They are: First - Clarity of vision, mission, goals and objectives. Second - We are aware of our own contribution to the attainment of suchvision, mission, goals and objectives. Third - Perform according to standards and have the willingness to improve oneself in the weakness identified. Fourth - Be result oriented and base decisions for subsequent actions on those results. Fifth - Be aware of your vertical and horizontal structure and be a functional member. Moreover, she presented the very situation of the Philppine school system today and why Enhanced K+12 be adopted, namely, "insufficient mastery of basic competencies due to congested curriculum, high school graduates (<18 years) lack basic competency and maturity, and other countries view 10 year education cycle as insufficient." She cited President Benigno S. Aquino III's advocacy statement on K+12; thus, "We need to add two years to our basic education. Those who can afford pay up to fourteen years of schooling before university. Thus, their children are getting into the best universities and best jobs after graduation. I want at least 12 years for our public school children to give them an even chance of succeeding." 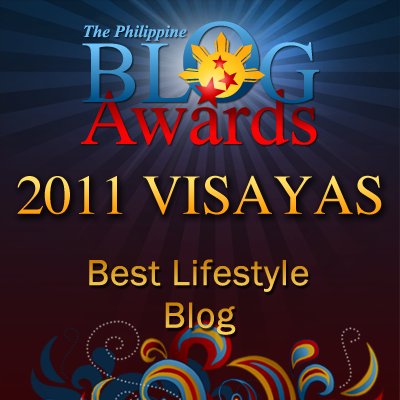 I'm really not expose to TV this days..Thanks for this kind of blog i am updated in some way. Hopefully changes in our educational system would help build a great foundation for Filipino students. I have great hopes. A++ for this post. Thanks for sharing. The program is really helpful for both educators and students. Goodluck on the upcoming events for K+ program, hoping it would be more successful in the proceeding months. What they should do is make schooling and learning fun and interesting. Also, the level of teaching has fallen as well. With K12, it's for the better siguro kasi DEPED wont do it if it is not. I hope the education system in the Philippines gets better..
i also miss being in school, and as a former student, I do agree with the K-12.. its just only additional 2 years of study, just make it fun and exciting for more interesting learning. Wish they could make something about the poverty too. It's one of the main factors that affects the child's education. Filipino children are willing to learn. The problem is, their parents cannot even afford to buy them pencils and papers.